This menu from 1950 at an F.W. Woolworth store is an excellent example of how much cheaper it was to eat out during the 1950's. 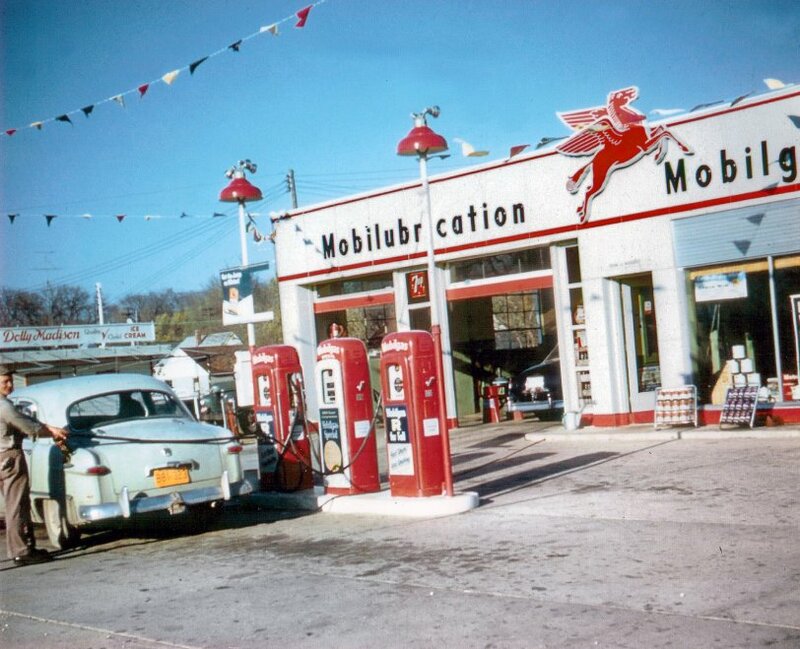 This photo of a full service Mobil service station brings back memories of when twelve stations like this lined Main Street and Military Highway in Pineville, Louisiana with all the stations closed today and nowhere to buy gasoline on Main Street today. I can remember driving with my sister to Hiawatha, Kansas from Pineville, Louisiana to see our mother. We took advantage of a gas price war in Texarkana, Arkansas to buy regular gas for 24 cents a gallon in 1969. 51 years later the price of gasoline here in Knoxville, Tennessee is in the $2.50 range. The gas that cost a total of $4.80 in 1969 would cost $50 today to fill a 20 gallon tank. The average price for a gallon of gas in 1950 was 18 cents with the price at the end of the decade being 25 cents so it was a bargain to buy gas for 24 cents ten years after 1959. The average cost of a new car was $1,510 in 1950 and by the end of the decade was $2,200. Even a Chevrolet Corvette was only $3,631 in 1958. A Cadillac convertible sold for $5,400 in 1959 with a 325 horsepower engine. Men’s all wool suits sold for only $28.90 in the 50’s while a cotton check dress sold for only $3.29. A one carat diamond ring sold for $399. This one carat diamond ring sells for $4,125 today. One price that doesn’t seem cheap even now is the Ronson men’s shaver selling for $28.95. It is amazing that a Singer portable sewing machine sold for $19.90. The latest Singer portable sewing machine sells for $89 today. Even rollaway beds sold for only $14.99 during the 50’s. Eggs – 79 cents dozen which is another price that has not risen much in the last 50 years. Came across the F.W. Woolworth 1950 menu image. Interesting info, especially the prices. I am pulling together information for a book about 1950 and am wondering if you would have a high-resolution (300 dpi) digital I could use. Wish I did have a high resolution digital. Best of luck with the book. Thanks for the memories. As late as 1987, I could eat lunch at a Woolworth lunch counter in downtown Toledo, Ohio. We had a Woolworth lunch counter in our town too. W.T. Grant stores also had a place to each lunch. Did anyone have a counter at Woolworths that sold only chowmein with dry noodles on a bun served with a frosted mug of rootbeer? Sounds weird but it was a treat. Barbara, Thank you for sharing about the chow mein with dry noodles and frosted root beer. I don’t remember the chow mein, but appreciate you mentioning it. Frosted mugs of root beer were a favorite of mine. Wish they served root beer that way today. In 1955, the average price of gas was $0.23 to a gallon. However, when adjusted for inflation, this is worth about $2.03 today. In mid-January 2015, gas costs $2.04 on average throughout the country and this may be a conservative estimate because some states are outliers with higher prices. This means that we’re back the prices of 1955 exactly 60 years later. I love filling up gas in NJ for $1.87. Bob, Thanks for sharing the news about the $1.87 gas in New Jersey. Lowest price I have seen in Louisiana is $1.78 in Lake Charles. Julie, Know what you mean…the prices today are out of sight. The five loaves of bread for dollar deals are gone. Instead it cost over a $1 for one loaf of bread today. Walgreen drug store on the corner, walk out through the huge revolving glass doortheat spinned continuously letting shoppers in and out. Our first stop, was always the Woolworth dime store across the street. I always ordered the same thing…turkey dinner with dressing, mashed potatoes, hot gravy, cranberry sauce, and a hot dinner roll with pats of real sweet butter. I can still taste those thick slices of white meat drenched in gravey. I was disappointed that the above menu didn’t include the turkey or roast beef dinners that Woolworth was known for. Ahhh great memories from thr early 1950’s. Thanks. Katy, Thank you for sharing those great memories from the past. Your description of the day after Thanksgiving meal at Woolworth’s makes me wish I had grown up in Chicago. I was only in Chicago one time in 1959, and will never forget the tall buildings in the Loop. Thanks for this information, but can you tell me how much you had to pay for a gallon of milk back then? The cheapest I remember is 39 cents. How much was soup at Woolworth in 1955? Irma, I couldn’t find 1955 prices but found a cup of soup at Woolworth’s in 1970 cost $1. How much did a gallon of milk cost? 82 cents a gallon is cheapest I know of. I have to say Andrew, this article is almost 9 years old now. And seeing all the comments over the years and you still replying to them is awesome! Thank you. I try to reply to anyone that responds.